Update: Gibson casino was acquired by a new group. Since the aquisition they became completely irresponsive and therefore we had to move Gibson to our Not Recommended casinos section. Below you can find our Top 3 casinos with a no deposit bonus. All of them are US friendly and offer superb variety of casino games, actually much wider than what can be found in Gibson casino. It took us time to review Gibson casino. The reason is that in the past, Gibson was a rather dormant mediocre casino. Yet, since it’s acquisition, we read and heard a lot of positive feedback and decided to check it ourselves. Trusted Rival casinos are not easy to find and we were glad to discover a reputable brand for US players to play at. 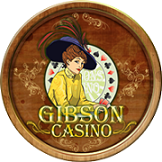 You can try Gibson Casino online with our $25 No Deposit Bonus. If you are familiar with Rival software, then you know that Gibson casino offers great variety of slot machines and other classic casino games such as Blackjack, Video Poker, Keno, etc. The slots are a split into 3 sections: 3 reel slots, 5 reel video slots and the famous i-Slots. Personally, Rival slots are one of my personal favourites. They have neat graphics and various bonus features and yet they do not become an arcade game, something that happens to many new released slots. The ones i like the most are the Reel Crime series, Midway Madness and the new Golden Gorilla slot. In total, you have 140 slots to choose from. You can play the games using the flash or the download versions. If you play on windows PC, i would recommend downloading the software since it offers full range of games. If you play on Mac, you will have to settle with the instant play version. The free chip has 2 terms that you need to be aware of: the maximum bet per spin during this bonus is $/£/€ 2.5 and you have to play at least 10 different games. 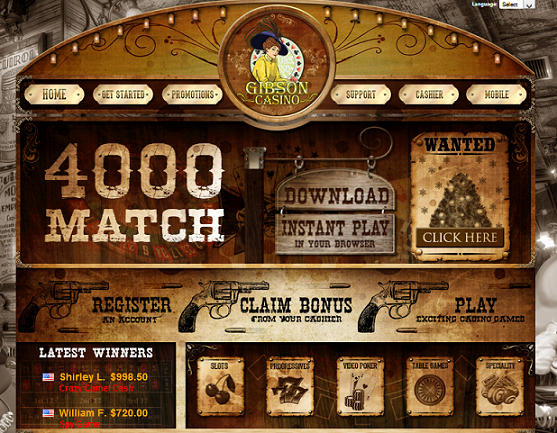 Gibson Casino offers new players a high % welcome bonus package. 1st Deposit: On your first deposit you can get a 400% up to $/£/€/AUD 2000. WR: bonus and deposit x35 times. This bonus has a max cashout limit of 5 times bonus+deposit. 2nd Deposit: 200% up to 500. WR: bonus and deposit x20. Maximum withdrawal is x6 bonus + deposit. 3rd Deposit: 100% up to 500. WR: bonus and deposit x25. There is no max cashout for this promotion. 4th Deposit: 500% up to 1000. WR: bonus and deposit x35. Maximum withdrawal is limited to 3 times bonus + deposit. Similar to the no deposit bonus, these ones also have to special terms: maximum bet per spin is 10% of the deposit amount. Second, you need to play at least 7 different games while wagering the bonus. All players can enjoy ongoing cashback promotions: 20% weekly and 10% monthly cashback. To qualify for Cashback promos, you need to have a minimum deposit of $/£/€/AUD 25 and minimum netloss of $/£/€/AUD 25 during that period (week or month). Gibson casino uses Rival’s built in mobile interface. It’s rather friendly and easy to use, but unfortunately the cool western vibe is lost. Currently there are 30 mobile slots and a dozen other casino games. The minimum deposit amount is $/£/€/Aud 20. The maximum withdrawal is $/£/€ 2,000 per week. The withdrawals are processed within 3-5 days. Deposit Methods: Visa, MasterCard, Skrill, Neteller, Ukash, ECO Card, UseMyFunds, PaySafe Card. Gibson casino online is licensed in Curaçao and it is sister to Tropica, Ricardos, Sahara Sands and Cashalot online casinos. Since it’s relaunch, the casino enjoys positive public opinion and so far we didn’t see any serious complaints. The withdrawals are fast, including withdrawals to US players. Great new US friendly Rival casino. Wide variety of games. High % bonuses to extend your play time. Fast payouts. Gibson is not perfect and has it drawbacks (max cashout limit on high promotions and special bonus terms) , but it is a good choice for US casino players.